Minutes outside of modern Cuernavaca, Xochicalco is a fascinating reminder of the ancient cultures that inhabited these valleys nearly 1,500 years ago. Originally built around 650 AD, Xochicalco is a stone city that at one point could have been home to as many as 20,000 residents. Famously known for its carved buildings, like the Temple of the Feathered Serpent, it was also the site of an observatory that tracked the annual motion of the sun as reflected through a towering chimney. Listed as a UNESCO World Heritage site, Xochicalco is a classic example of the fortified cities that were built in the Epiclassical Period after the fall of Teotihuacan, and was one of the area’s most powerful centers of political and religious life. In addition to exploring the ancient buildings, Xochicalco offers sweeping views of modern day Cuernavaca, as the site is located on a series of hills that humans have wandered for centuries. 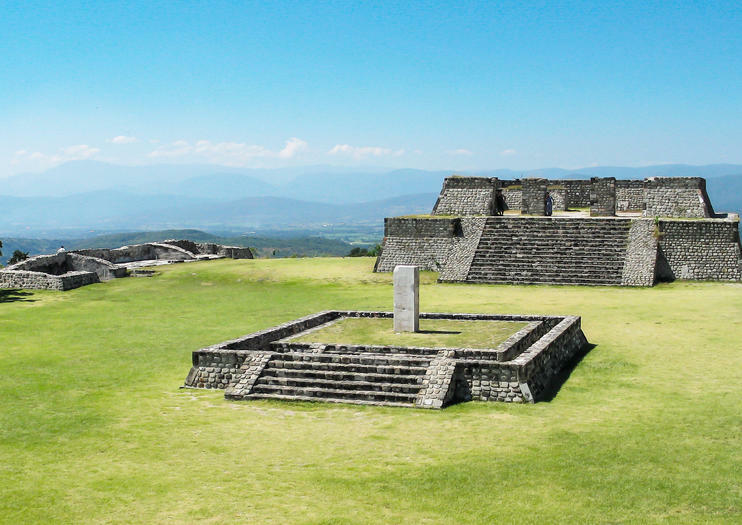 The most convenient way to visit Xochicalco is as part of a guided tour. You can also hire a taxi from Cuernavaca and have them wait outside, or take a local bus—though schedules can be intermittent. Weekdays tend to be much less crowded than visiting Xohcicalco on the weekend, and entry inside the observatory is only available after 12pm. Did You Know? Though it thrived for over 200 years, Xochicalco was inexplicably abandoned around 900 AD, where evidence points to an outside invasion that set the city on fire. Visit two of Mexico’s UNESCO World Heritage Sites on a full-day, private tour from Mexico City to Taxco and Xochicalco. Traveling in a private, climate-controlled vehicle, you’ll leave the city behind on your way to the colonial-era city of Taxco, then find gorgeous architecture in the 250-year old Church of Santa Prisca. Next, head to the pre-Colombian city of Xochicalco and explore an ancient observatory, pyramids, and magnificent sculptures. With pickup and drop-off at hotels in Mexico City, this tour includes all entrance fees and guided tours at each site.